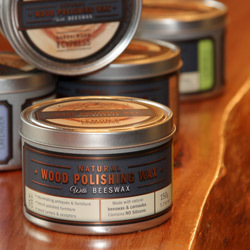 Suitable for professionals and beginners alike, Buckley & Phillips' natural wood polishing wax has been precisely formulated for use on wood turnings, french polished furniture and rejuvenating antiques. A highly scuff resistant wood polish, made with a natural wax blend including beeswax and carnauba wax that is far superior to ordinary polishes. Available in 3 Australian-inspired scents.